Dear Dr Kalra, I am reporting against Dr ****** of ***** hospital. He did a renal transplant on my uncle. But it led to complications and uncle was in hospital for long. I watched the surgery on YouTube. Now I know doctor used wrong technique. Please take action against doctor. Dr K.K. Kalra staggered when he read the email. Open proclamation of 'guilt' against a doctor based on an Internet search? "This will only get worse," muttered the chief of the National Accreditation Board for Hospitals (NABH), India's quality control body for hospitals. He received far too many complaints these days, 50 per cent of all, from disgruntled families and friends of patients. He shuddered at the thought of what the future might hold. Doctors are in the dock. Lawsuits filed by aggrieved patients are jamming up courtrooms across the country. Their names get splashed day after day across front pages of newspapers, on computer and television screens across the nation. It is the kind of exposure every doctor dreads. Chastened by medical litigation and intimidated by negative publicity, a culture of defensive medicine of unnecessary tests and medications or refusing patients with complex illnesses as a safeguard against future litigation, hangs over our hospitals. Here's an alarming statistic: 98,000 deaths from medical injuries occur in India every year, reports an ongoing NABH study. Here's another: medico-legal cases have gone up by 400 per cent in the Supreme Court in the last 10 years, according to legal resource, Manupatra. Patients are afraid of an uncaring medical system. Doctors are terrified of assertive patients. Hospital life is under scrutiny, and with it the authority and autonomy of doctors. "Doctors are afraid," says Dr Arvind Kumar, chief of robotic and chest surgery at Sir Ganga Ram Hospital in Delhi. "The trust factor between doctors and patients is slowly coming down and there is no solution in sight." Every day, the headlines get worse, although in reality just 10-15 per cent cases are ever proved against doctors. Check out 2014: in January, a premature baby in Meerut died of burn injuries from an overheated incubator. In May, a hospital was asked to pay Rs.7 lakh after a woman lost her uterus during a caesarean section. In July, a Chandigarh doctor was asked to pay up Rs.70 lakh for amputating the wrong leg of a teenager. In June, a newborn in Coimbatore lost eyesight while in hospital. In July, a Bangalore woman with uterus tumour died of anaesthesia allergy. In August, a patient declared dead by a doctor was found alive when grieving relatives went to collect his body in Malda, West Bengal. Who is at fault? Ask forensic experts, who ultimately determine if a medical malpractice case has merit. Four such doctors from Mysore Medical College and Grant Medical College, Mumbai, have drawn up a profile of medical negligence cases with the National Consumer Disputes Redressal Commission, this year: medical negligence cases involving surgery account for 80 per cent of all cases, of which obstetrics and gynaecology (29 per cent) top the list, followed by orthopedics (22 per cent). "Hospitals are found to be negligent, along with doctors, in 34 per cent cases," says lead researcher Dr Anand P. Rayamane. Of the various reasons for death, negligence of doctors (49 per cent) is cited the most. 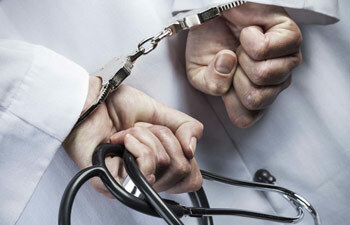 "Negligent doctors need to be punished. But medical errors are also often 'system errors' and not the result of an individual physician's negligence," says Dr K. Srinath Reddy, former head of cardiology with AIIMS and currently president of Public Health Foundation of India. The scientific basis of good clinical practice depends on combining a well-gathered history of illness, physical signs and results of tests into an estimation of probabilities of possible diagnoses, he explains. While medicine is not an exact science, which always gives a 'yes' or 'no' answer, the 'art' of medicine lies in converting scientific evidence to standard management guidelines created by expert bodies, for all practitioners to follow. "Apart from minimising errors and avoiding unnecessary tests and treatments, adherence to guidelines forms the best defence against allegations of medical negligence," he adds. The buzz among doctors is also on crippling compensations. 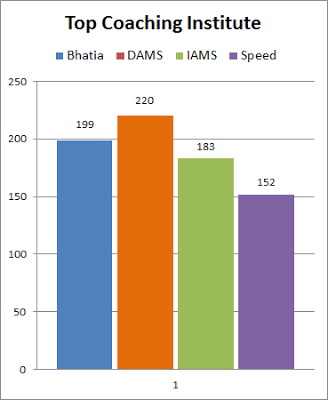 In the latest issue of the British Medical Journal, Indian doctors have come head to head. "In India, healthcare is supposed to be regulated by a quasi-judicial medical council that has failed to protect against widespread negligent and irrational treatment," writes Dr Kunal Saha, a US-based doctor who received 'historic' justice-an unprecedented compensation of Rs.11.5 crore-in October 2013, for medical negligence that caused his 36-yearold wife Anuradha's death in 1998. "Large payouts awarded by the courts of law may be the only way to instill accountability for wayward doctors and to save lives." "In 2030 BC, the code of Hammurabi, the king of Babylon, was to chop off a doctor's hand for making a mistake. This approach may prevent future mistakes but after some time few doctors would be left with hands to operate. 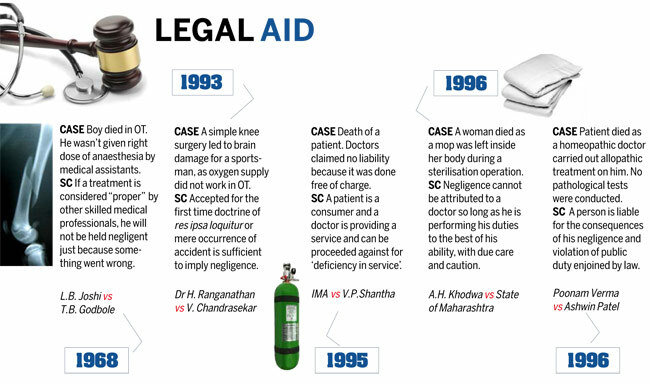 India's current legal position on medical negligence is not vastly different from Hammurabi's code," says Dr Devi Shetty, cardiac surgeon and chairman of Narayana Hrudayalaya in Bangalore. Although the Supreme Court of India has rightly upheld the law of the land in Kunal Saha's case, he explains, punishing negligent doctors financially will encourage them to practise what is called defensive medicine. What is defensive medicine? Consider this: an elderly man was rushed to a hospital in Kolkata after he collapsed from what was suspected to be a stroke. His daughter came out of the critical care unit, crying aloud that one sentence that sets nerves on edge in hospitals: "They have left him unattended." Her family huddled in worry: "We will shift him to another hospital." He was too sick to move but she created a fuss, clicking his medical reports on her cell phone and bringing in doctors from outside for a second opinion. That sealed their case. The hospital went tight-lipped, doctors became brusque and evasive. The daily question, "How is he?" met with the daily answer, "The same." As soon as the feeding tube was removed from the patient's nose, the hospital discharged him on just a 24-hour notice, without giving the family the leeway to set up alternative plans or room to appeal. It doesn't have to be a life-and-death situation. Defensive medicine can corrode the basic trust between doctors and patients in an everyday setting and lead to unnecessary expense. For example, a middle-aged couple comes to a doctor. The man complains of a burning sensation in his chest right after eating, which radiates all the way to his neck. The doctor diagnoses him with indigestion, suggesting a change in diet and some pills. But the patient and his wife continue to look anxious. The doctor, although convinced that his diagnosis is right, orders a barrage of tests to rule out a heart attack: an echocardiogram, a tread mill test, a homosysteine and lipoprotein test, a 64-slice CT angio scan. The tests cost Rs.15,000 and, although not medically necessary, they protect the doctor in case of any future claims of insufficient advice. Have doctors become more negligent? The kinds of malpractice hitting the headlines are not new: in 1953, a boy with a fractured limb died in Pune as a doctor operated on him without proper anaesthesia (Joshi vs Godbole, SC). Sixty years later, in 2013, a three-year-old boy died in Bangalore during a dental procedure from wrong dosage of anaesthesia. But for so long, no one really knew how many such cases occurred. Now the numbers are what first stand out, and what also make the questions necessary. According to a 2013 study (Global Burden of Unsafe Medical Care) by Dr Ashish Jha of Harvard School of Public Health, of the 421 million hospitalisations in the world annually, about 42.7 million adverse events of medical injury take place, two-thirds of which are from low-income and middle-income countries. India records approximately 5.2 million cases a year, ranging from incorrect prescription, wrong dose, wrong patient, wrong surgery, wrong time to wrong drug. With public awareness, claims and litigation are rising. In the country's consumer courts, they now top the list of 3.5 lakh pending cases. According to Dr Girish Tyagi, registrar of Delhi Medical Council, the appellate authority for dealing with such cases, the number of cases from overcharging, needless procedures, wrong doctors to wrong decisions has zoomed in the last two years, from about 15 complaints a month to 40 now. A report by the Association of Medical Consultants shows that there were 910 medico-legal cases against doctors between 1998 and 2006 in Mumbai. Now they are going up by 150-200 cases every year. The laws are problematic, entangling patients, doctors and hospitals in an unholy mess. "Doctors and judiciary speak in very different language," says Samuel Abraham, law officer with the Christian Medical College in Vellore. "Typically, doctors respond to court summons by apologising. But to the judiciary, that's an admission of guilt." Most hospitals do not have their own legal officers. Hence cases become complicated and continue for long. Hospitals also do not have advocacy cells, to communicate with patients amicably, without getting into litigation. "The problem with most hospitals is that they never have settlement in mind. If there's even an iota of deficiency in service, it's best to compensate," he says. "But hospitals lose a case, appeal repeatedly, and litigation carries on for years, wasting everyone's time, energy and money." But it's the gap in the law that seems to leave both patients and doctors at a dead end. "For the longest time in India, medical negligence was not seen as compensable," says barrister Sushil Bajaj of The Integrated Law Consultancy, Delhi. "It was extremely limited in scope and not really codified." The two ways of getting compensation are now through the law of torts (personal injury) and the recently introduced Consumer Protection Act of 1995 (CPA). "But there are problems with both," he explains. The CPA is for all consumers of goods and services-broken toasters to patients dying of medical negligence all balled up in the same can of worms and the language is "quality of service provided" not, strictly speaking medical negligence. "As a result, there's an enormous volume of work for the judges," he says. "They neither have the time nor the expertise to go deep into medico-legal cases. There is no scope for cross-examination. Judges just go by affidavits or reports." In regular civil courts, patient-doctor relationship is governed by the tort law (personal injuries). "Again this law is not codified in India," adds Bajaj. The biggest problem of the law is that it does not clearly address what is 'adequate compensation'. "Kunal Saha's case is a benchmark because for the first time we recognised that there are other heads of compensation, the modern trends in tort that need to be expanded." These range from "loss of consortium" for deprivation of family relationship, "punitive damages" for gross negligence to "exemplary damages" to punish and deter shocking conduct. For Bajaj, whatever the end result, if the best doctor in the world errors even once he must pay compensation as a professional. And it should be adequate. "A person who has suffered cannot be without remedy." "My experience would make doctors afraid of giving their opinion. This is called defensive medicine." That's the famous first reaction of oncologist Dr Praful B. Desai, Padma Bhushan awardee and former director of Tata Memorial Hospital, Mumbai, after he was absolved of all charges of medical negligence by the Supreme Court in 2013, in India's longest medical lawsuit that dragged on for 26 years. The legal battle had been started in 1989 by a former bureaucrat after his wife, a cancer patient, had died. As the number of negligence lawsuits against physicians escalates, it takes a terrible toll on doctors. "The alarming increase in litigation has triggered a widespread fear," says Dr Kumar. "All doctors are keenly aware of the risks and even the hardworking, conscientious ones feel vulnerable to litigation." Many hesitate to touch patients with complications and those involved in lawsuits suffer from depression, burnout, emotional exhaustion and often become suicidal, he explains. The obvious fallout is that the doctor-patient relationship is turning adversarial. It has become an article of faith among many doctors that patients kick up a fuss as an easy way to settle spiralling bills. "This is one of the most common things we see and this is true across the country, especially the metros," says Dr Kumar. "Doctors are under tremendous pressure. Any bad outcome today gets labelled as 'medical negligence', with friends and family of the patient threatening to call television channels to scare a hospital into waiving off their bills." It's also pushing doctors toward heavy professional indemnity policies. "It is usually around Rs.10 lakh, with a premium of Rs.3,000-Rs.5,000 per annum," says Dr Neeraj Nagpal, convenor, Medicos Legal Action Group, Chandigarh. If a doctor wants to cover himself against a claim of Rs.11.5 crore, the amount awarded to Saha, the premium will be between Rs.300,000 and Rs.600,000 annually. For that a doctor will have to attend to a large number of patients every day and raise his fees substantially. "With rising litigation, everyone will have to pay through their nose." There are good doctors and there are bad doctors, just as there are good patients and bad patients. And it's hard to know whom to feel more sorry for: the Mumbai cancer surgeon last year who said, "My successful career is ruined for no fault of mine," when a patient he had declared dead suddenly started moving? Or the Delhi man who kept harassing a doctor with lawsuits for years because he had not said, "I'm sorry," after his wife died of cancer at his hospital? The sign of the time is getting clearer every day: public demand. "That's the biggest driver of change. 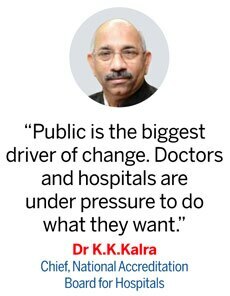 Doctors and hospitals have to do what they want," says Dr Kalra. That can be a good thing: it can improve accountability of doctors and hospitals. But so long as patients recognise the dangers in this shifting balance of power. Does anyone gain if the trust that makes doctors and patients a team is shattered? Once sued, most doctors are twice shy. But four years ago, in 2010, the Supreme Court held out a ray of hope for doctors. A bench of Justices Dalveer Bhandari and H.S. Bedi had pointed out the need to protect doctors from "malicious prosecution": "It is our bounden duty and obligation of the civil society to ensure that medical professionals are not unnecessarily harassed or humiliated so that they can perform their professional duties without fear and apprehension." Change will require looking at medical practice and malpractice in a new light: not just at material costs, but that the trust that exists between patients and doctors remains sacred.